There is no way that she is not going to win the Oscar for this as well!I have seen/heard dozens of actresses sing this song but Anne’s performance had be balling my eyes out in a matter of seconds! Wow, she was good! 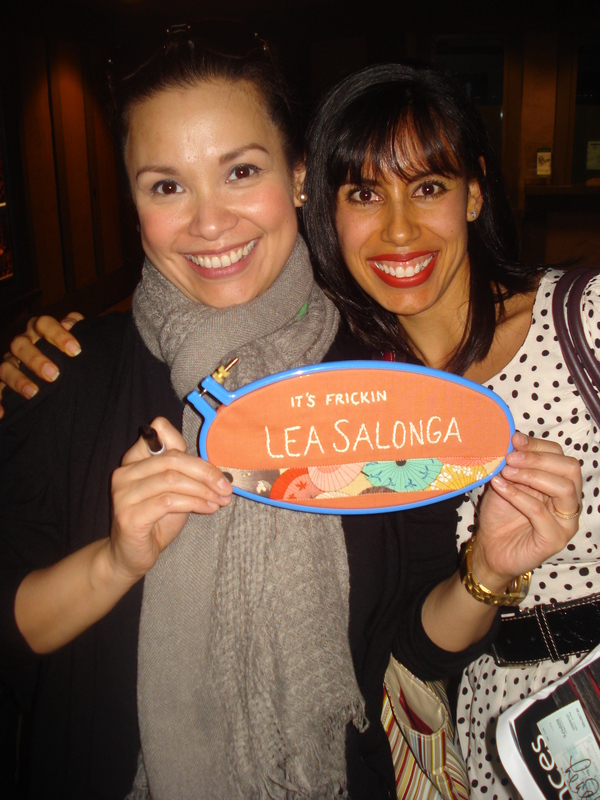 And for extra fun, let us now watch a small cut of the song as performed by the best stage Fantine ever… Lea Salonga! And did you like that little PBS plug at the end to purchase the DVD? Well, I did and I got mine signed by Lea herself! I know that I’ve shared these before, but perhaps you have never read my blog before, so share again I must! I still can’t believe that actually happened! Now the signing off the photo/blu-ray and the photo on the right happened on two separate nights after performances of Allegiance a new Broadway-bound musical that is set to open sometime this year. It was absolutely amazing, but we’ll discuss that musical at a later time! I digress! 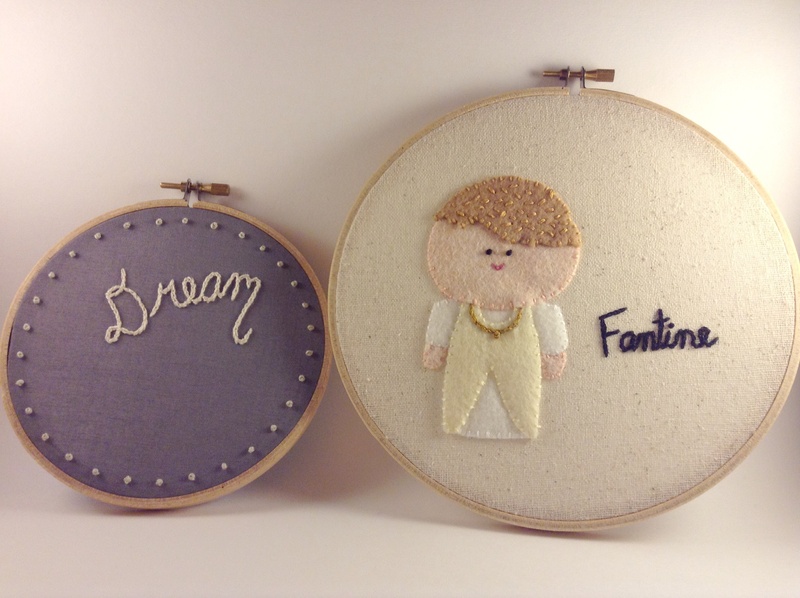 This is my stitchy take on Fantine’s song. This hoop went through many revisions, but I did not like the look of the entire title so I stuck with the key word: dream. 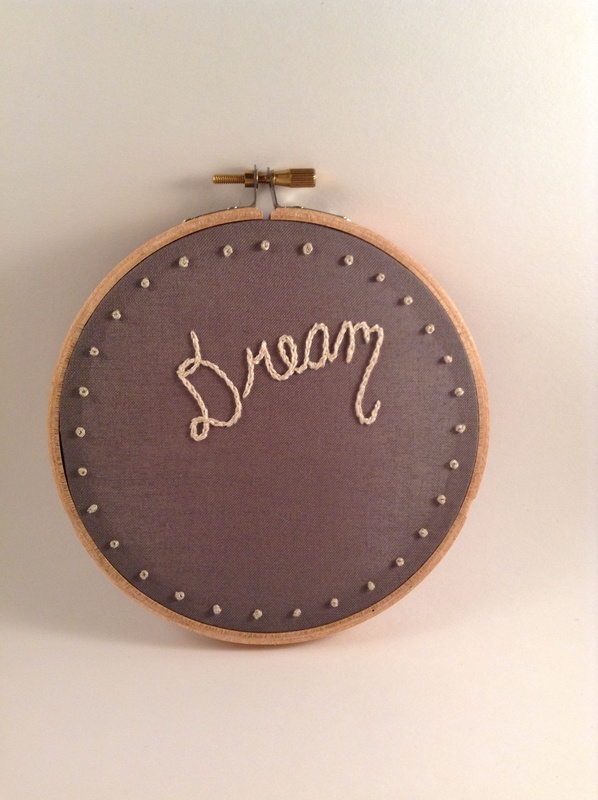 This is a super simple hoop made of French knots and split stitches but I really like it. Fantine’s lfe was a tragic one but in the final scene she does appear to be an angel, of sorts, that guides Jean Valjean to heaven, so we can assume that Hugo’s fictional afterlife treated her better than her time on Earth. All’s well that ends well!